#485 Bizarre Turkey w/ Uncle Sam Head ! This vintage 1915 era postcard holiday postcard is a nice one! It's heavily embossed with very bright colors. The large bird displays an Uncle Sam head! The front reads "Thanksgiving Greetings". A bizarre old patriotic postcard view! Back has a divided back and is postally unused. Condition is excellent as shown. Any other lines or waves are from the scanner and not on the actual image. Your item is shipped to you safely in a rigid mailer. #483 Patriotic Uncle Sams w/ Turkey !!! 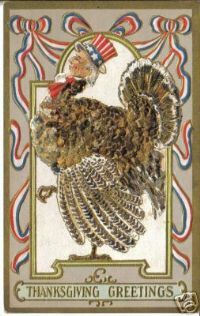 This vintage 1915 era postcard holiday postcard is a nice one! It's heavily embossed with very bright colors. Uncle Sam is proudly shown on each side of a large turkey! The front reads "Thanksgiving Greetings". A nice old patriotic postcard view! Back has a divided back and is postally unused. Condition is good to very good as shown with no creases or tears, but the slightest of corner wear as shown. Any other lines or waves are from the scanner and not on the actual image. #342 1921 Turkey w/ Boy Hatchet ! Here is a cute embossed Thanksgiving postcard! A boy with hatchet / axe sneaks around a huge pumpkin while a turkey hides on the other side! Back is divided and unused, but is hand written "Midd. College 1921". Condition is excellent! Here is a nice old Thanksgiving postcard! It pictures a large turkey, with sheaf of wheat, grapes and other fruit. He stands against a Patriotic field of red, white and blue! A nice old image! Condition is good with the lightest of edge wear. Back is divided and unused.